Juliana & EWS collab project 2017: Get on yer bikes ladies! 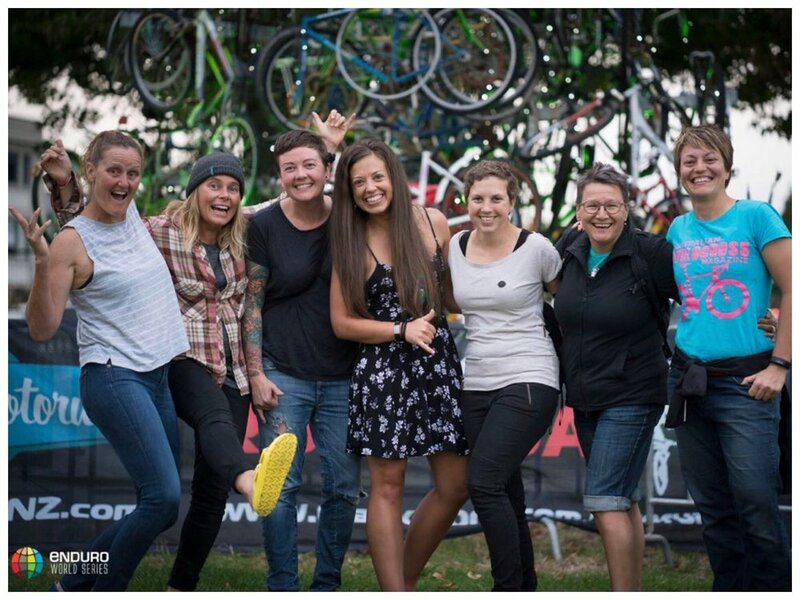 Juliana Bicycles & Enduro World Series focus on all the ladies during the 2017 season. This was our first year collaborating on these ride outs with Juliana Bicycles and the Enduro World Series at select race rounds. These ride outs organised & led by Anka Martin, a Juliana Bicycles ambassador was a way for us to connect to all the women out there at the races who are riders but not necessarily racers. 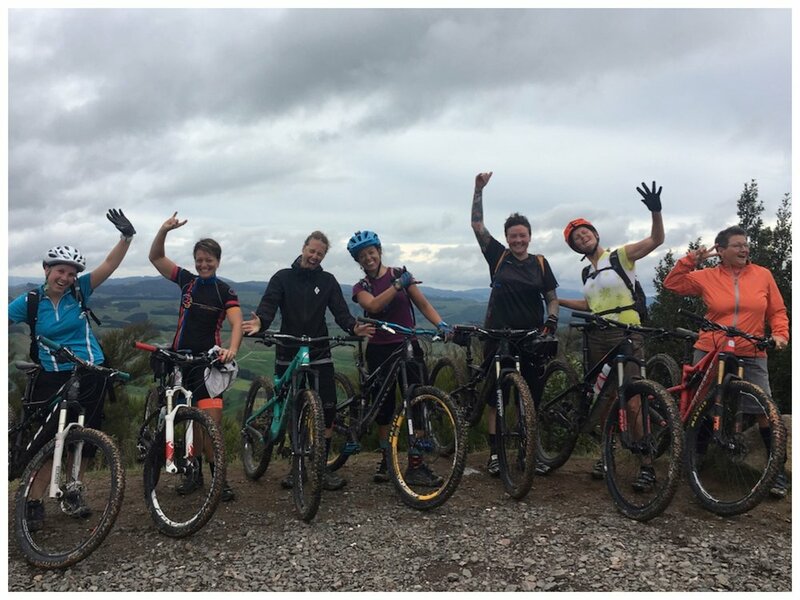 They may be out there supporting their spouse’s, boyfriends or kids, but we wanted to treat the ladies with a day out on the trails, offering a supportive platform for them to maybe explore some new trails, to possibly push their riding limits and to maybe try something a little out of their comfort zones. Whatever their abilities, we wanted to organise a special day out for them, each one followed by a lunch and drinks of course. Our first stop this year was in Rotorua, New Zealand. We wanted to show the women something outside of the Redwood forest, maybe introduce them to a bit of hike bike, a mini adventure of sorts, so we headed out to Rainbow mountain, followed by lunch and a soak in the warm Kerosene creek and then back to Rotorua for a yoga session followed of course by afternoon cake and coffee (and beers) to top off a magic day out. Tasmania was next on the EWS calendar. Not really knowing what to expect from this little place, or how many women would be out there, we were blown away by their hospitality, amazing trail network and the amount of women who wanted to come riding with us. Thanks to Vertigo Bikes who generously offered to give us a free shuttle to the top of the Blue Tier trails & to the Weldborough Hotel who organised a high tea for us - yes, a high tea complete with champagne and cucumber sandwiches for post ride entertainment. What an amazing trail, a true classic to put on your have to ride bucket list and the people, the hospitality and friendliness will stay with me forever. Get yourself over to Tasmania to ride your bike people! Madeira was next on our itinerary, another new and exciting venue for the Enduro World Series. Some of you may have heard of their local delicacy Poncha - a very potent drink made up of mainly rum, sugar & lemon. Anyhow, we decided that for this round, instead of just treating the women, we were going to include everyone and set up a full bar with two barmen making fresh Ponchos right at the finish line - for everyone to enjoy after a big day of racing. It was potent and not for the faint hearted, but then again neither were the race tracks, so we thought everyone would be able to handle this. Some loved it, others not so much, but we ran out of Poncha, so that was a good indication of another successful Juliana EWS treat. Off to mountain biking Mecca - Whistler Canada! We all know the riding in Whistler can be quite intimidating and quite gnarly, so we thought this would be the perfect place to take a group out on a trail that may be quite challenging to try to progress their riding to the next level and to just feel a bit more confident riding the black trails in this part of the world. You don’t have to go far to find technical, steep trails around here, so after a coffee and pastry we all set off up the steep Blackcomb climb to ride Microclimate. All the women were so enthusiastic, nervous, brave and exhilarated after conquering this trail. They pushed their riding to the next level, scared themselves just a little bit, had heaps of fun, but most importantly encouraged and supported each other to try different challenges. We all made it down in one piece, with the high five’s and loud chatter in overdrive! Pretty amazing how you meet a group of complete strangers for coffee and a few hours later we’re sharing lunch & enjoying beers as friends. How cool are bikes?! Tutto Bene in Finale Liguria! This ride out was a huge success. We organised two shuttle vans with Italy’s fastest woman, Louise Paulin who owns JustRideFinale. She guided us on some of her favourite home trails, showing the women all the good lines. Of course lunch is as important as bike riding here in Italy, so we stopped for a delicious lunch at Louise’s restaurant Osteria del Cantoniere in the hills of Melogno. I’m not talking a quick sandwich here, it was proper sit down, homegrown, good food followed by home made dolce & coffee of course. We had to take it easy on the vino intake as we still had to navigate our way down the famous Rollercoaster trail all the way back down to the beach & the gelato shop. Aaaaamazing day! Gracie mille Juliana Bicycles & Enduro World Series for spoiling all the ladies who ride bikes and to all the women who signed up for our ride out’s this year!